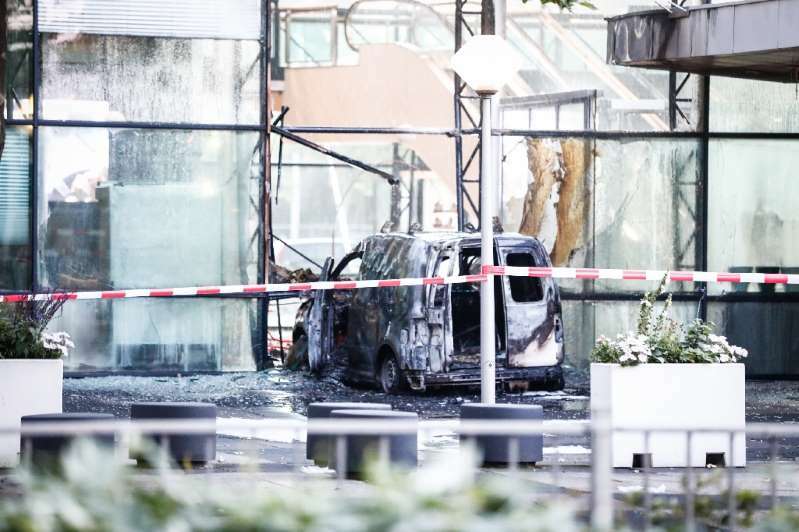 Dutch police are investigating after a van deliberately slammed into the headquarters of one of the Netherlands' top newspapers and media groups early Tuesday, catching fire but not causing any injuries. "This morning about 4:00 am a delivery van was driven into the facade of a publishing house in Basisweg" in Amsterdam, police said in a tweet. The building houses the head office of De Telegraaf, a popular Dutch daily tabloid, which focuses on sports, crime and gossip around celebrities. The police said the act was believed to be intentional, but no-one was hurt and the driver had fled the scene. They have launched a manhunt and are appealing for information. The van burst into flames on impact, and fire services were swiftly called to the scene. Television images showed fire officers dousing huge flames leaping around the white van lodged in the building's glass-fronted facade. Dawn revealed the area had been completely charred and reduced to twisted metal, and the Telegraaf said it believed it had been a deliberate attack. The paper added that the van had not been able to penetrate into the building as the front windows were made of special safety glass. The incident comes after a man fired an anti-tank weapon into another building in the Sloterdijk area of Amsterdam which houses media organisations. A 41-year-old man has been arrested for the attack last Thursday which also caused no injuries. Police identified the man in a statement as a leader of a local motorbike gang.